he LAFF-IT-OFF Productions in Barbados is a humorous show which takes a critical and sarcastic look at local and regional issues, whether political or social. This annual production is based on the art of improvisation, which may cause the script or production to be altered occasionally to incorporate major “late breaking” developments. Because Laff-It-Off productions are flexible and can change to suit its audience, the performances are embraced by Barbadians both living in Barbados and abroad. 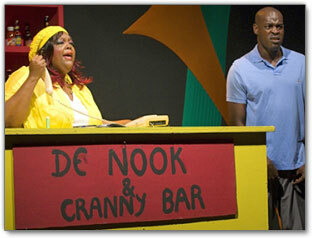 Laff it Off was originally developed by Community Productions in September 1985 to promote popular theatre in Barbados. Laff it Off Inc. was incorporated in March 1993 with Cross, Estwick and Thompson. Cross directed most of the company’s stage productions between 1985 to 2000 and Thompson was the senior actor in these performances. Cross resigned in 1997 and was succeeded by his wife Cecily Spencer-Cross, a qualified and regionally respected theatre artist,who is now responsible for directing the company’s productions. Estwick remains a director and is the company’s producer and manager. The Laff-it-Off Show is now staged annually from January to April. Check out schedule/dates for Laff-it-Off 2018 " SIZE 'ROUND' "
Laff it Off 2018 " SIZE 'ROUN' "
BOX OFFICES - Click here! Saturday Come enjoy a cultural comedy stage show of side-splitting skits and performances. Send Laff It Off Productions Comedy Show Postcard to a friend!